It’s been proven in the field! ABS Group services showcase applied to all market sectors of the building industry while addressing the requirements of business profitability, sustainability, growth and environmental protection. When it comes to ground-source heat exchangers, ABS offers the industry complete service. Under an Engineering Procurement & Construction (EPC) contract, ABS will design the installation, procure the necessary materials and construct it. 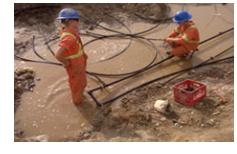 Geothermal is our total focus; it is what we do. And, our sub-contractors have a proven track record of successful, on-time and on-budget projects to show for it. Turnkey-Custom Build Geothermal Systems that fits in your FISCAL & ENVIRONMENTAL GOALS. For speed, lower cost and higher quality, Turnkey Custom Build delivery can't be beat. 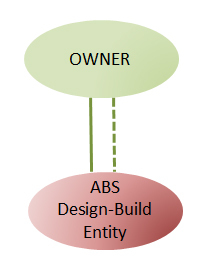 Simply put, custom-build creates a single contract between the owner and ABS. While other delivery methods require the owner to contract separately with a designer/architect and contractor, custom-build contracting method ties all elements together and relies on the roles, relationships and responsibilities of every participant. In the custom-build contracting method, ABS provides design, engineering, installation, testing and commissioning services. The process we use is designed to improve owners’ control over the geothermal project, reduce risk and unpleasant surprises, and ensure the end result meets owners’ expectations. ABS also offer complete building integrated design approach as a whole will provide significant savings in Mechanical and Electrical Systems, or in some case reduce or eliminate systems. 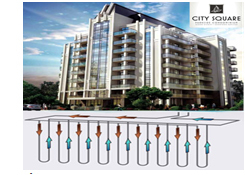 Our leaders have complete knowledge of how we fully integrate every existing building system with Geothermal, Solar etc in order to maximize the clean energy resources available to building. ABS Group is excited to introduce our clients to a new integrated package of inspection, verification, testing and certification services for Geothermal Systems. We are constantly looking beyond customers’ and society’s expectations in order to deliver market leading services wherever they are needed. As the leader in providing specialized Geothermal Solutions that improve system efficiency, quality, safety and reduce risk, we help customers navigate an increasingly regulated world. Our independent services add significant value to our customers’ operations and ensure sustainability. When it comes to Geothermal, ABS as a leader offers the industry complete service and solution. Design is the critical first step in developing a cost effective Geothermal project and ABS experts are there to help you. We work closely with clients in order to fully understand their requirements and bring together our team of engineers, HVAC design engineers and geo exchange specialist to design the most suitable system for our client’s particular needs and requirements. We are continuously implementing futuristic, revolutionary & eco-friendly building technologies, in order to make more efficient, environmentally friendly and price worthy use of energy in buildings. ABS simulation methodology is based on a combination of empirical validation, analytical verification and comparative analysis techniques. 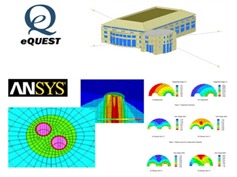 We use sophisticated software ANSYS to perform geothermal modeling & simulation. 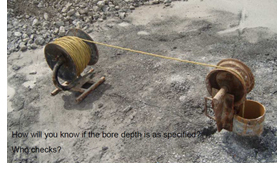 Actually, we are the first & the only firm in the World that brings Life To Geothermal Design, Engineering & Analysis. We believe systems engineering analysis leads to clear conclusion and finally conclusion leads to Cost effective and Energy Efficient Solutions. Analysis also provides benchmark to compare with different design options through techno-economic analysis in order to optimize the system design. We are the first & the only firm in the World, providing Geothermal based spot cooling & heating solutions for industries. We are bringing innovation to work which require new method of design, new approach to technologies and new set of services. Each industrial system design by our leaders is tailor to meet the needs of the client while ensuring optimum system efficiency, sustainability and most importantly occupant and/or process comfort. While many Engineering firms can produce good conventional designs for industrial buildings, ABS Group is one of the few firms with has the skills and experience to deliver cost effective, energy efficient, environmentally clean and safe Industrial space conditioning solutions. ABS ESCO offers TURNKEY Design-Build solutions to Industrial Sector. Our Geothermal based Design/Build Construction method is unique. By leveraging Turn-Key’s experience, the project will be completed faster, less expensively and without cost overruns created by “change orders”. To accomplish this, we utilize our unique system Modeling and Preliminary Design Evaluation techniques to explore all of your options and identify all major areas of concern at the beginning of the process. By doing this, we are able to give a firm price quote after agreeing on the preliminary design concept. This allows us to run the concept, design, working drawings and construction phases concurrently. Those using the “Plan/Spec” method of construction management run those phases consecutively, creating a longer and more costly project. We delivered Carbon Neutral Buildings. The 2030 Challenge is a North American based move to reduce the greenhouse gas emissions for all new buildings to zero by the year 2030. The fossil fuel reduction targets are aggressive: 60% in 2010; 70% in 2015; 80% in 2020; and 90% in 2025. At this point in time, the emphasis for the 2030 Challenge carbon reduction is focused only on operating energy. It presently is not considering the carbon implications of construction, the materials used in the building, the use of the building or associated transportation costs. It is felt that the impact of operational energy is of greater significance as its negative costs to the environment will persist for the life of the building. Buildings that are currently including issues of sustainable design in their mandate, are likely already addressing some aspects that support carbon reductions. The issue of carbon in buildings is complex. There is carbon involved in the extraction of the resources that we use to create products; in the transportation of these products to the site; in the physical construction of the buildings; in the operation of buildings; and in the lives of people as they carry on business. ABS Group has over 20 years of engineering experience in buildings system design and helped create some of Canada’s most state of the art and efficient projects including Carbon Neutral Buildings. Each of our system engineering & design is unique and tailored to meet the needs of the Client while ensuring optimum performance, sustainability and most importantly occupant comfort. New technologies are constantly being developed to complement current practices in creating greener buildings and structures, the common objective is that green buildings are designed to reduce the overall impact of the built environment on human health and the natural environment by efficiently using energy, water, and other resources, protecting occupant health and improving employee productivity & reducing waste, pollution and environmental degradation. We are continuously implementing futuristic, revolutionary & eco-friendly building technologies, in order to make more efficient, environmentally friendly and price worthy use of energy in buildings. Our services have earned a reputation for timely, high-quality service and solutions in cost-effective manner using innovative and current technologies that reduces energy consumption rates of buildings by 40% to 75% and most importantly client’s environmental footprint. We specialized in Energy Conservation and Design of sustainable & green buildings. We believe that renewable energy is a way to sustainable planet. We want to make it easy for our clients everywhere to make smart, more sustainable out of the box design decisions. The environmental and energy challenges throughout the world are numerous and complex. Most individuals, commercial & industrial companies, municipalities and governments are now on the sustainability bandwagon to provide solutions to our energy & power problems. With the shrinking natural resource pool, the demand for alternative energy & power solutions are growing sky-high. Coupled with it is the rapid growth rate of economies among the developing countries of the world and unrealistic rise in world population which is already exceeded 7billion. The growing demand for more power and energy have led to more utilization of natural resources and consequently putting more pressure on the natural store house of non-renewable resources including fossil fuels like –coal and petroleum. Effective energy solutions are the need of the day. ABS Group's experience extends to many energy & power technologies including Geothermal & Solar. Solar power is one of the best ways among alternative energy sources to compensate the power requirement. If properly utilized, geo-thermal energy holds a vast potential unlike other energy solutions fulfilling most of the energy requirements. We provide a unique resource in Alternate Energy & Power solutions to meet our client needs. Please visit our Energy & Power section to know more about our solutions. Building energy simulation and optimization engineering provide benchmark to embed energy efficiency in buildings by predicting their behavior under given climatic conditions and usage patterns. It also helps to predict energy consumption in buildings and provide opportunities to compare with different design options through techno-economic analysis in order to optimize the building design. Besides sailing through the process of building energy simulation up to report preparation stages the entire process helps in decision making related to use of insulation on roof, efficient lighting, advanced glazing, high performance HVAC system can be taken with much elevated confidence level. Simulation tool methodology is based on a combination of empirical validation, analytical verification and comparative analysis techniques. Our leading experts have in depth experience of Building Energy simulation and optimization. Our Green Building team can guide your project, and even the majority of your portfolio, toward LEED certification. We have the expertise to assist with every stage of LEED certification, from choosing the physical location of your site, to implementing sound operations and maintenance practices, and on to educating occupants about eco-friendly choices. As members of USGBC’s LEED certification review team, we bring our first-hand knowledge of LEED requirements to help clients earn LEED certification for their projects. Our services include assessing client needs, determining feasible options, implementing plans to meet requirements, overseeing necessary LEED documentation, and administering the roles and responsibilities in LEED. What sets the services and products of ABS apart from our competitors is that we have a truly interdisciplinary team of LEED Accredited Professionals within our Green Building Practice. Our in-house team encompasses not only engineers, architects, and systems specialists, but also energy managers, facilities managers, writers, and educators, all with breadth and depth of knowledge. When we bring our combined skills to bear on the needs of your buildings, you may expect our thinking to be fresh and incisive, understanding and understandable, and expressed in a language free of jargon. We have a dedicated and devoted team of Professional Consulting Engineers with decades of experience in providing building engineering services such as Mechanical, Electrical Plumbing, Fire Protection etc, to all market sectors. Our engineering services have earned a reputation for timely, high-quality services and solutions in cost-effective manner by using innovative and current technologies such ground source heat pumps, solar energy systems, carbon neutral energy systems etc. In our opinion, if the building is not carefully designed to lessen its impact (material and energy requirements) from the outset, it will not be possible to provide adequate renewable energy to allow the building to operate. Our early involvement with every project helps in saving client’s money & time, reduce risk and achieve designs with higher levels of performance and greater success. Teamwork is paramount in delivering and meeting our clients’ objectives, day in and day out, and therefore, we maintain a highly motivated, experienced and skilled team. As Program Manager, ABS Group offers an expanded scope of management service. In this role, ABS Group manages the planning, feasibility, design, construction reviews of a multiple-project/multiple-phase program. In addition our leading experts provide services to help client to take benefit of financial incentive programs or Tax benefits offered by Federal and Provincial authorities to promote green technologies in high performance building. Canada still lags behind many other countries in its support for renewable energy. Most of us who have been in the industry for a while are self-taught. There are many other institutions that will be offering training programs in the very near future. ABS GROUP bears a responsibility to our Clients, our Planet, our Employees & our Society at large. We strongly believe that we have a duty to the Generations that will come after us. Society’s acceptance of our actions is crucial to our success. Only if we can win broad acceptance our activities can we be successful in the long run. To put it in a nutshell, the challenge facing us is to win the trust of society – which can only be done by providing trainings and engaging in open and honest dialogue. A range of technical training programs are available to help train an experienced renewable energy labour force. We can train you for the right qualifications; and support you afterwards so you can build a rewarding green career as a Renewable Professional.